Since Apple iTunes is the renowned iPhone manager that can be used to manage the contents of different Apple devices like iPhone & iPad, not every Apple user is at ease with it due to several issues such as limited file formats to upload, syncing of purchased media files only and difficult to understand user interface etc. If you are also tired of and want to get rid of iTunes to manage files and contents of your Apple device, then we have a best iTunes alternative here for you in the form of IOTransfer 3. It would be the best iPhone manager to replace old and tricky Apple devices manager (iTunes). IOTransfer 3 is a one-click management solution for Apple users as it offers several benefits and features that everyone with Apple device love. It is more than a simple iPhone manager due to the features and benefits it offers. 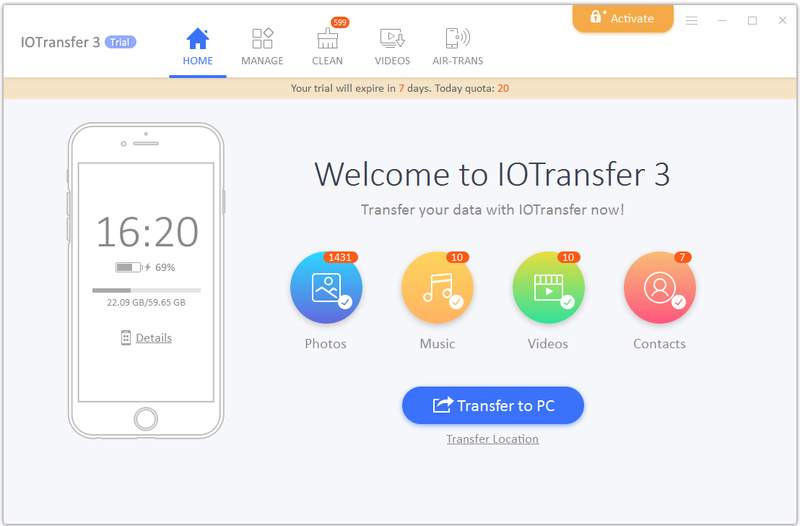 IOTransfer 3 not only allows you to transfer files directly between your Apple devices and desktop but also offers a cleaning feature to free some space when it comes to transfer something important when the device is running low on internal storage. It also allows you to download and convert videos in different file formats without using any external downloader and converter. It is a simple yet most powerful iPhone manager and helps Apple users to manage their devices’ contents and files conveniently on desktop computer or laptop. It is known as the best iTunes alternative to expediently import and export files like videos, photos, music, ebooks and voice notes etc from different Apple devices like iPhone and iPad. IOTransfer 3 is free from all data transferring boundaries that Apple users face while using iTunes to transfer or manage files stored on their devices. Just give it a try and you will come to know that how it is fulfilling the needs of billions of iOS users across the globe. When it comes to transfer important personal or business related files or data between devices and desktop, it enables you to create a backup for all your data and files in order to deal with the situations when things went wrong due to some technical reasons. Not only a file management tool but it is a video downloader too and making the life of Apple users easier than ever who love to download latest videos from different online sources and websites. Its powerful and free YouTube video downloader makes it easy for users to download their favorite movies, convert the video files in favorite format and automatically transfer to the user’s iOS device easily. Not only from YouTube but it allows a user to download videos from different social media platforms like Facebook, Twitter and Instagram etc. A user can also use this video downloader to download and save videos to PC for later use. 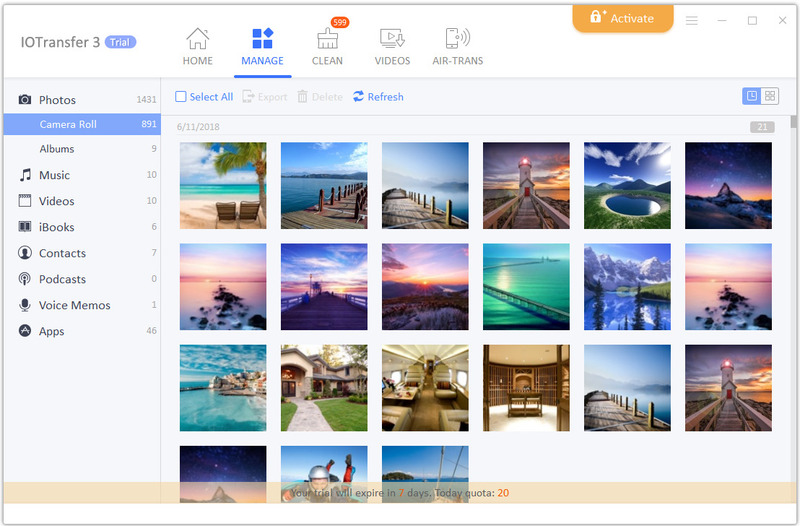 IOTransfer 3 also has a powerful video Converter that helps you fluently convert videos into different file formats and then automatically transfer them to the connected Apple device. It also makes you worry-free from unsupported file formats to provide you a great video experience on your favorite Apple device. You will also love to you HEIC to JPG converter that lets you convert all your HEIC files into JPG conveniently in no time. Is there need to transfer some files or data between Apple devices wirelessly in real time? Don’t worry about the matter because IOTransfer 3 has AIR-TRANS which uses WiFi direct technology to transfer files like videos, photographs, music and eBooks wirelessly in real time without facing troubles. The technology can work for the PC as well if on the same local network. Let you make your iPhone junk free with one click junk file cleaner powered by IOTransfer to free up space for important files and data. 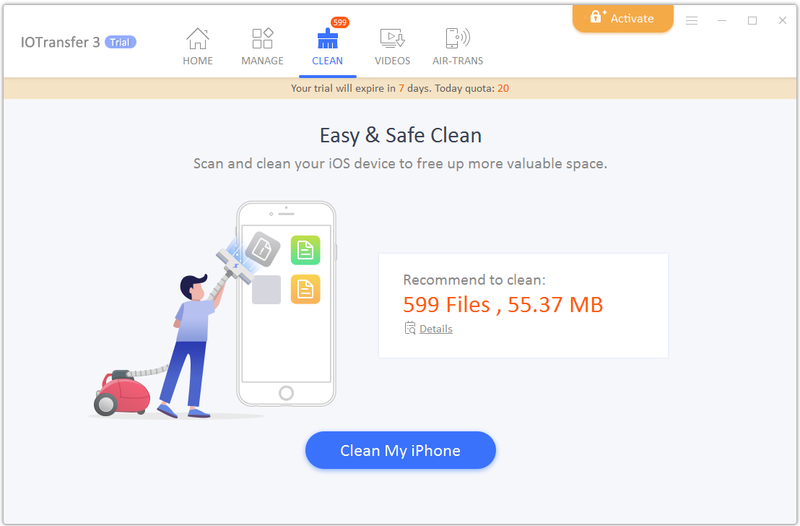 The cleaner not only help you free up some space for important files but also makes your iPhone faster than ever by removing all junk and unnecessary cache files. IOTransfer 3 has a sleek, simple and easy to operate UI that makes it the best iTunes alternative. It supports more than 14 languages to satisfy the needs of Apple users worldwide.